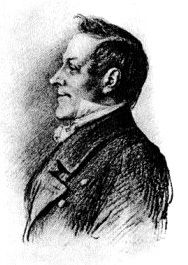 Opinions concerning the quality of the work of the Austrian poet Johann Baptist Mayrhofer (1787-1836) may be divided, but one thing is a fact: among all the poems Franz Schubert set to music Mayrhofer's rank second only to Goethe in numbers and some of the results of this particular cooperation, such as "Nachtstück" or "Lied eines Schiffers an die Dioskuren", belong to the greatest achievements in the art of Lieder. Mayrhofer's fascinating and somewhat tragic life has repeatedly been the object of scholarly studies and I have delved into this particular topic myself in an article titled "Dokumente zur Biographie Johann Mayrhofers", in: Schubert durch die Brille 25, (Tutzing: Schneider, 2000), 21-50. What is the reason for this odd discrepancy of almost two weeks? 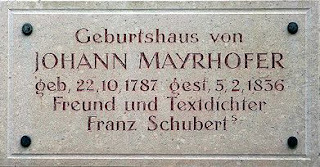 It turns out that Mayrhofer's baptismal entry in the records of the Stadtpfarre Steyr was never consulted by any of the above authors and that the date 22 October given on the plaque on the house Pfarrgasse 12 is correct. 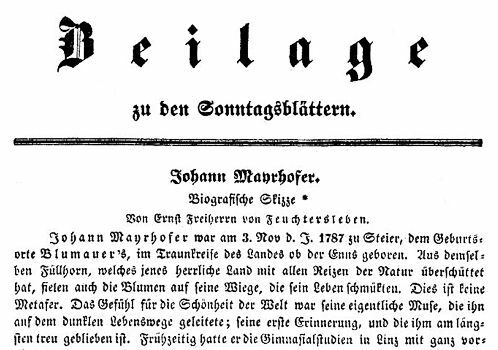 The false date "3 November 1787" was put into existence by Mayrhofer's friend Ernst von Feuchtersleben in his "Biografische Skizze" in Beilage zu den Sonntags-Blättern of 15 October 1843. The entry concerning the baptism of Johann Baptist Mayrhofer (Stadtpfarre Steyr, Tom. 1784-1813, 16). Susan Youens's suggestion that Mayrhofer's "unclear date of birth" was caused by two different baptismal registers, is false. So pleased to find out. Finally we have the exact date!